Emoji, stickers and much more will spread through all aspects of our digital lives as they support complex human communication needs that have evolved over thousands of years. My Mum uses emoji. I use emoji. My friends’ teenage sons and daughters use emoji. Everyone is loving emoji. Increasingly, we’re all also using stickers. Stickers are giant size emoji that insert inline in a messaging app conversation. You name it, there is likely a sticker pack for it. And exploding right now are apps for you to make your own stickers. The interesting question is why these things are taking off so fast. Why the relatively sudden explosion in popularity? To really understand that, we need to take a step back from the improvements in technology that are enabling rapid adoption of emoji and stickers, because this isn’t a technology thing, it is a very deep human thing. Human communication is a complex, deep topic to understand, and has evolved over many thousands of years. The Internet is still relatively young, barely twenty years old. So how we communicate online is still catching up with how we communicate offline. Offline communication is rich in levels of expression, online communication is still rudimentary in comparison. So we have a long, long way to go, and emoji and stickers are only the beginning. Anyone who has ever flirted with someone will tell you that there’s a lot more to a conversation than just the words spoken. Subtleties of body language, gestures, tone of voice, and eye contact add layers of meaning and additional signals to what we’re merely saying. That’s why messaging apps are quickly morphing into something more than just a transcript of a conversation. Emojis and stickers have caught on with pretty much everyone because, simple as they are, they add texture, fun, and humanity to a chat. For most of the twenty years we’ve had the Internet in daily life, our common online communication tools were primarily text based: email, SMS, Docs. But most human communication is not language. It’s not spoken word. It’s body language. Gestures. Eye contact. It’s how we look, behave, and react to one another. The animal kingdom does a fantastic job of communicating without words, without text, without language. Indeed language only developed in Homo sapiens between 30,000 and 100,000 years ago. We evolved and survived for the longest time with only other ways to communicate, primarily gestures and body language. The Japanese encoded the first emoji in the early 1990s, and people wondered whether it was a cultural phenomenon limited to places like Japan where cuteness and anime are more common throughout society. But emoji rapidly spread around the world once they were introduced in Unicode in 2010, meaning they could be reused by many different devices, browsers and apps. Communicating via emoji and stickers is often faster, richer, and more expressive than via text. Arguably the most clicked or tapped thing in the world is not a word, it’s a giant picture of a thumb. It’s faster than ‘OK’ or ‘Yes’ or ‘Got it’ or ‘I agree’. Human emotion isn’t limited to our personal lives. So it’s no surprise to see the increased use of emoji in work communication. This has long been common in Asia, and is becoming the norm in the western world, as people understand the benefits. There is much precedent for shorthand behaviour to make communication more efficient. Phrases we say that help us understand our colleagues in fewer words: “Loop in” “Circle back” “Tee up”. So much so there are memes about “business buzzword bingo”. That said, these phrases help people communicate faster, so expect a dramatic increase in non-text based ways to communicate in the software we use for work. It’s easy to imagine that we won’t send our customers or colleagues a sticker, or indeed a sticker that includes a selfie. But I’m convinced we will. And we’ll do it frequently. Don’t underestimate this. This is a deep human communication need, it’s not just for teenagers and interns. Today emoji and stickers are mostly split. But this is simply historical precedent and it’s clear that they will merge. The line between what is an emoji and what is a sticker is really unclear. Is a sticker not simply a large sized emoji that inserts directly into a conversation? Stickers can be custom, but so can emoji. When designing the introduction of emoji and stickers into Intercom, we thought the difference didn’t make sense, so we designed one thing to do both. We think the following pattern will become the norm. This makes much more sense than showing the emoji rendered really small in a chat bubble. We use the same UI picker to render both emoji and stickers. So we have a long way to go for online communication to catch up with offline communication. Simple emoji and stickers were never going to be enough. 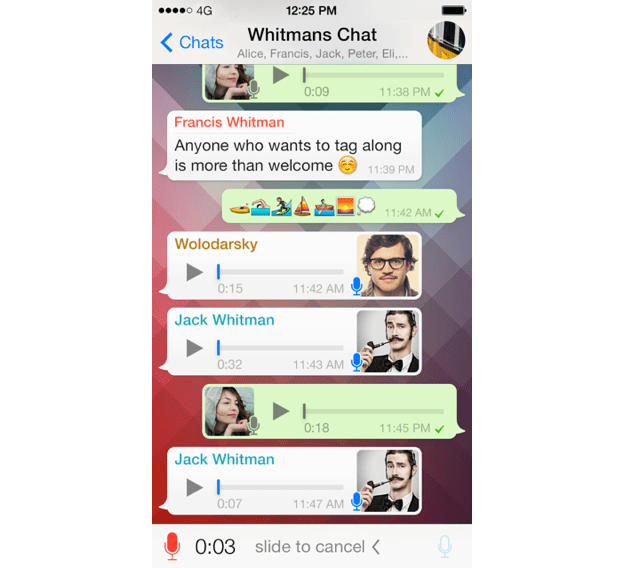 In messaging apps today we have text, emoji, stickers, but also animated gifs, recorded voice and video messages. This is just the beginning of many different ways in which we’ll express ourselves through mediated communication tools and at times have fully flowing conversations without ever using any text. In the next 18 months we’ll see lots and lots of new things here, whether it’s sharing your heartbeat via an Apple Watch, or selfie stickers via services like Imoji or Path, or services like the new Bebo, or things we haven’t even thought of yet. 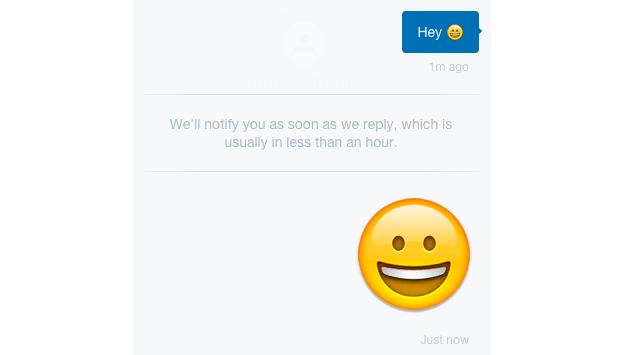 At Intercom we see our introduction of emoji and stickers as just the beginning. We’ll likely add support for custom emoji and stickers, short video clips, short audio clips. This is a very real, very deeply rooted human thing. Our online communication tools finally starting to allow us to express some of the richness that exists in real life. And in our communication with our customers and colleagues as much as with our family and friends.